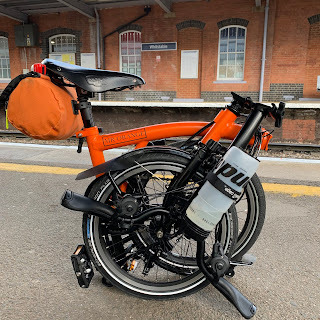 My Orange Brompton: Brilliant Bikes, quite simply brilliant! All of the black parts were purchased from them and in fact virtually all the stock Brompton parts blogged about were bought from them. Why are they so good? They are able to process orders really quickly and delivery is free. They are an email/telephone call away should you need advice on a certain part. Their knowledge about all things Brompton is as good as someone working at Brompton. In addition to their online presence they have a shop and it was at this very shop I had the black headset fitted along with a new bottom bracket and a general service. Everyone I know with a Brompton has used Brilliant Bikes and I have yet to find anyone who has a bad word to say about them. They do of course sell other bicycle related parts and accessories but I have only ever bought Brompton items. I suppose I am writing this blog post because I think they do deserve a special mention. Check out their website if you haven't heard of them and I do believe that they ship to EU countries. *I write this purely as a very satisfied customer of several years standing. I receive no discounts or freebies.